The Freedom FC Juniors Academy program is dedicated to develop young players in the "Golden Years of Learning". We want players to learn to love the game while developing positive habits and attitudes. At the youngest ages, it is important to have fun while training in soccer and athletic ability. The Jr Academy program is about player development over winning. We will be teaching foot skills and encourage creativity. Our staff has applied their vast knowledge and experience while creating a fun and positive soccer curriculum where players can develop. 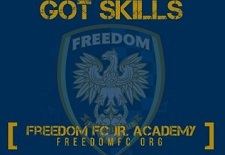 Each registered player will receive a Freedom FC training shirt.